Peripheral intravenous catheters are medical devices used to infuse fluids and medication directly into the veins of a human body or draw blood samples for testing purpose. Peripheral intravenous catheters are inserted into the patient’s body using a needle which can be removed once the catheter is in place. Thereafter, a peripheral intravenous catheter can be attached to the patient skin by using medical adhesive tape. This report covers the global peripheral intravenous catheter market performance in terms of revenue contribution. The report includes key trends, drivers, restraints, and opportunities influencing the growth of the global peripheral intravenous catheter market. Impact analysis of key growth drivers and restraints, based on the weighted average model, is included in this report to better equip clients with crystal clear decision-making insights. The global peripheral intravenous catheter market is mainly driven by factors such as increasing the number of diseases and infection among people, enhancement in peripheral IV catheter technology and increasing per capita healthcare expenditure. Complications arising from peripheral intravenous catheter application including blood exposure and needlestick injuries, and the high cost of advanced peripheral IV catheter in emerging regions such as APEJ and MEA are expected to hamper the growth of the peripheral intravenous catheter market. By product, revenue from the integrated/closed peripheral intravenous catheter segment is projected to expand at the highest CAGR of 8.9% during the forecast period. By product, short peripheral intravenous catheter segment is expected to dominate the global peripheral intravenous catheter market, accounting for the maximum share of the overall market by 2021. Short peripheral segment revenue is projected to expand at a CAGR of 4.9% during the forecast period (2015–2021). By technology, the safety peripheral intravenous catheter segment is estimated to dominate the peripheral intravenous catheter market, accounting for a maximum share of the overall market by 2015 end. Revenue from safety peripheral segment is projected to expand at a CAGR of 7.1% during the forecast period. On the basis of products, peripheral intravenous catheter market is segmented into the short peripheral intravenous catheter and integrated/closed peripheral intravenous catheter. Short peripheral intravenous catheter segment is further sub-segmented into ported peripheral IV catheter and non-ported peripheral IV catheter. By end-users, the peripheral intravenous catheter is segmented into hospitals, ambulatory surgical centers, clinics, home use, and others. In terms of value, North America dominated the market with over 45% market share in 2014, followed by Europe. Peripheral intravenous catheter market in Asia-Pacific region is projected to expand at highest CAGR of 6.7% during the forecast period. The peripheral intravenous catheter is venous devices manufactured using silicon and other user-friendly materials to avoid side effects. These properties enable patients to retain PIVCs in their veins or body for long durations of time without suffering ill effects. Basically, peripheral intravenous catheters are used to infuse medication and various fluids directly into a vein of a patient. The global peripheral intravenous catheter market was valued at US$ 3,500 Mn in 2014. North America was the largest market for peripheral intravenous catheters, accounting for over 45% revenue share of the overall market in 2014, followed by Europe with around 27% share. Moreover, Asia-Pacific market is expected to exhibit highest CAGR of 6.7% during the forecast period (2015–2021), followed by the North America. Factors such as increasing per capita healthcare spending, increasing aging population, increase in a number of diseases, and advancement in PIVC technology are expected to support a growth of the peripheral intravenous catheter market over the forecast period. 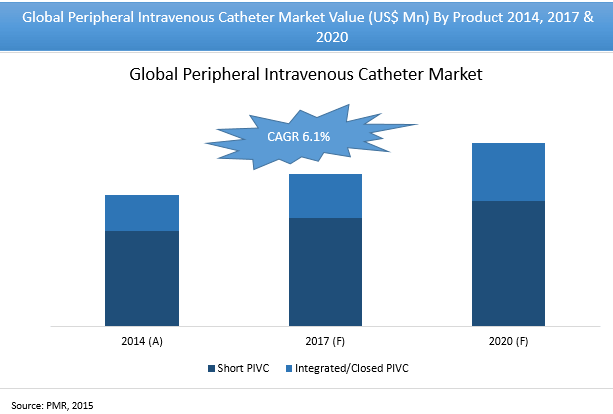 The global peripheral intravenous catheter market is estimated to be valued at US$ 3,663.7 Mn by the end of 2015, reaching a value of US$ 5,224.7 Mn by the end of 2021 at a CAGR of 6.1%. By product, the short peripheral intravenous catheter segment accounted for around 73% of overall market value in 2014. By technology, safety segment was valued at US$ 2,164.8 Mn in 2014 and is expected to increase at a CAGR of 7.1% over the forecast period to account for US$ 3,448.6 Mn by 2021. By end users, hospitals segment contributed the highest revenue at US$ 2,147.6 Mn, accounting for approximately 61.4% share in 2014. Ambulatory surgical centers segment was the second-largest segment by end users, accounting for around 19.6% revenue share the same year. Key players in the global peripheral intravenous catheter market include Becton Dickinson and Company, B. Braun Melsungen AG, Smith Medical, Terumo Corporation, C. R. Bard, Inc., Tangent Medical, and Vygon Group. Leading players operating in the peripheral intravenous catheter market are collaborating with other key healthcare solutions and services providers in order to advance their operational efficiencies and provide improved patient care.